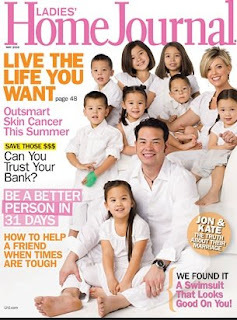 Jon and Kate Gosselin pose for the cover of Ladies Home Journal with their 8 children. The couple spoke to the magazine about the ‘breakup’ rumors and their hectic life. Would she return to the quieter, pre-sextuplet and camera days? Gag me with a spoon. I have 7 children, and I would never disrepect my husband like Kate does on camera. I can not imagine what it must be like off camera. Maybe this is the wakeup call they needed. What happened to Colins hand? I think what we see is whats its like, and camera or no camera this is what they are really like. I love the show, because its real. If kate changed how she acted in front of the camera then it wouldnt be real and she would be acting all the time. The cameras are always around and now there just part of the family. “Donna” I’m sure that you do disrespect your husband thats life, i dont want to watch a fake show if you do then dont watch jon and kate plus8. Everyone should stop being angry about the show if you dont like it dont watch it! I think people must hate there lives to be constantly picking on this show. The show is so “unreality” now. I used to enjoy it in the beginning when they seemed like a family just trying to cope with raising that many kids. They are no different from families I knew when I grew up other than their’s all almost all the same age. They have changed even though Kate declares they haven’t. Jon claims he needs time with friends but why do we never see any kind of “friend” or “family” relationships in their lives. The show is only about their money, fancy house, trips, hair transplants, surgery, etc. It’s not day to day but all about what Kate and Jon can milk from the money. The best show which depicts what probably is more normal large family living is 18 Kids and Counting and Table of 12. The Jon and Kate show has run its course and I for one have stopped watching. I find it interesting now what’s been in the media and how they want to deny their problems. Kate should take a step back and be happy with what they have and get rid of the cameras. Next reality show will be the 8 kids in their teens showing how messed up their lives are because of this show. It’s too bad their kids don’t seem to even have any family in their lives – grandparents, etc. Only the camera crew – how sad. Too bad about the family and about the show. Kate is desperately trying to hold the shwo together for the sake of money. Naturally of course given the expenses of raising 8 children! Who wouldn’t want to ensure a great future for the family. Zeesh can you blame them? If a family doesn’t have to struggle, why should they? ?